On July 14, 2015, NASA’s New Horizons spacecraft made its historic flight through the Pluto system. This detailed, high-quality global mosaic of Pluto was assembled from nearly all of the highest-resolution images obtained by the Long-Range Reconnaissance Imager (LORRI) and the Multispectral Visible Imaging Camera (MVIC) on New Horizons. The mosaic is the most detailed and comprehensive global view yet of Pluto’s surface using New Horizons data. 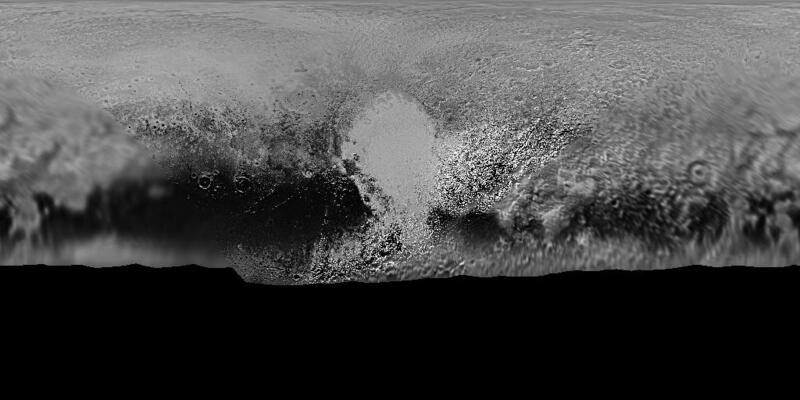 It includes topography data of the hemisphere visible to New Horizons during the spacecraft’s closest approach. The topography is derived from digital stereo-image mapping tools that measure the parallax – or the difference in the apparent relative positions – of features on the surface obtained at different viewing angles during the encounter. Scientists use these parallax displacements of high and low terrain to estimate landform heights. The mosaic is available in Equirectangular projection at an equatorial pixel scale of 300 meters per pixel. The ISIS3 cube in original 32bit file format is available from the ancillary section. This map was produced using radii of 1188.3 kilometers for Pluto. The original 32bit pixel values were linearly stretched to 8bit (1-255) using the input range of 0.03344 to 0.99981. 8bit (1 to 255) as scaled from original pixel values of 0.03344 to 0.99981.